The Pilgrim’s Guide to Santiago de Compostela presents the first complete English translation of Book Five of the Liber Sancti Jacobi or Codex Calixtinus. This twelfth-century guidebook traces the route from southern France to Santiago de Compostela in northwestern Spain. The medieval Christian world knew three major pilgrimage sites – Jerusalem, Rome, and Santiago de Compostela. 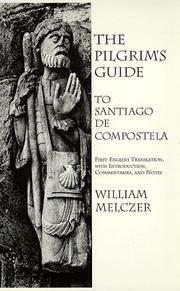 Between the eleventh and thirteenth centuries Santiago de Compostela was by far the most popular. Pilgrimage to Compostela was a once-in-a-lifetime human adventure. Hundreds of thousands of pilgrims came year after year through France and across the Pyrenees to Santiago de Compostela near the Atlantic shores of Galicia. In his study of the road to Santiago, Professor William Melczer discusses Relics and Pilgrimage The Origin of the Cult of St. James Myth and Historical Reality The Iter Sancti Jacobi The Liber Sancti Jacobi Pilgrimage without Ideology The Iconography of St. James. This book also includes extensive commentaries and notes that highlight historical, geographical, art- historical, hagiographic, and general cultural matters along the route traced by the Guide. Illustrated, introduction, gazetteer, hagiographical register, bibliography, index.